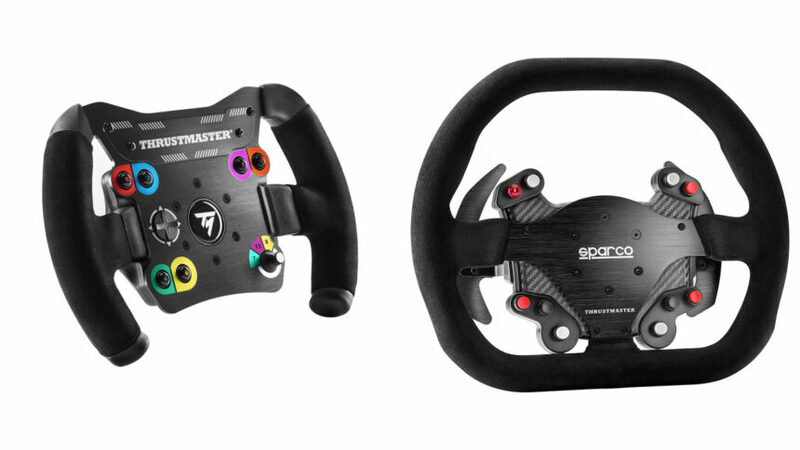 Thrustmaster continued its sim racing product offensive this week with a pair of steering wheels. The Sparco P310 and Open Wheel have both been available before with wheel bases, but now sim racers can pick them up a la carte. It’s the latest move from Thrustmaster to allow drivers to pick and choose their builds. Of the two wheels, the Open Wheel is the older model. As the name implies, it’s a racing-style wheel with most of the rim gone. That makes the 11″ wheel incredibly light — under 2lb — despite coming with all-metal shift paddles and litany of buttons and switches. It also includes plug-and-play support for the BT LED display. The Sparco P310 is the bigger choice, coming in at a full 12.2″ thanks to its 1:1 replica nature. The entire squircle-shaped rim is wrapped in suede, with faux carbon fiber supports for its nine face buttons (plus D-pad). Its aluminum paddle shifters are over 66% larger than the ones on the Open Wheel, measuring 5″ long. That should make shifts easier no matter what your hands are doing. Thrustmaster’s existing wheel ecosystem accepts both of the new add-ons, from the T300 base up to the T-GT (read our review here). Both wheels got their debut earlier this week at the Blancpain GT practice session at Paul Ricard. Pre-orders start early next month, with availability beginning mid-April for the Open Wheel and late June for the P310. Prices are €129.99 and €199.99, respectively.